Fig. 8. Technique of chromosome embedding in epoxy-resin: (A) cup of aluminum foil; (B) slide with a squash to which the cup filled up with Araldite is attached. The square on the back side of the squash shows the field with chromosomes (arrow); (C) the cup with hard Araldite block after polymerization at 60°C for 24 h; the block was detached from the slide with a scalpel after dipping it in liquid nitrogen; (D) plastic holder for Araldite block; diameter of the hole (double arrow) is the same as the Araldite block after stripping the foil (E); (F) Araldite block is inserted in the plastic holder for analysis under the light microscope. mosomes under the light microscope with high magnification (100x). 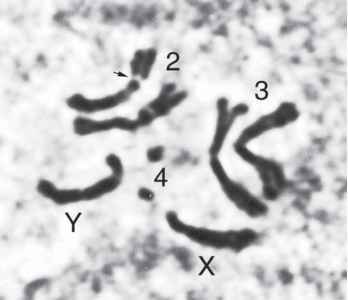 The selected chromosomes can be marked using a special objective marker (see Fig. 9A), which was devised by A. Yu. Kerkis (33,34). 4. Thickness of grid's film can be evaluated by its color. Usually, we use yellow or goldish film, with a thickness of 80-100 nm. Thickness of the film depends on the temperature and humidity of air in the room. Hot air and dry air make the film thinner, whereas low temperatures and humid air make it thicker. Change the concentration of Formvar to establish the desirable film thickness. 5. For best results, the DNA for in situ hybridization must be prepared in the form of restriction or polymerase chain reaction fragments with lengths >500 bp. 6. The antibody concentration has to be found experimentally using immunofluo-rescent techniques; it must not be less than 3-5 |Jg/mL.